Firstly, I’ve been on the main blog site, reading and posting. There are so many great people on this site it’s amazing. I just wish we didn’t have to meet this way…. Well, my story: I am 42, have been active all my life, play various pickup sports, go hiking, biking, etc. Some of favorite sports include ball hockey, soccer and badminton. Three weeks ago I was playing drop-in badminton, 40 minutes in so was fairly warmed up. The opponent did a drop shot on me so I started to lunge forward. As soon as I pushed off, I felt something pop in the back of my right calf. It really felt like if you yank a string really hard and the string breaks with a snap, except this was much louder, more intense , and extremely painful. I was in so much pain. I tried getting up but I couldn’t. The pain was just too intense. I got to this hospital in an ambulance and the ER doctor did the Thomson test and immediately told me it’s a torn Achilles. He said he could feel a gap where the Achilles should be. However he sent me home in a splint and asked me to see a bone doctor the following day. Upon hearing everything the doc said, we decided against surgery. This is the trend nowadays, he said, and the difference between having and not having surgery is not that great. With good physio, the difference becomes insignificant. The process is slower, though, but there is no risk of surgery or complications of surgery. I was put in a cast, and was told to keep weight off the leg. That was the most painful two weeks ever! On Tylenol 3’s for about a week. The only thing that helped was to keep my leg elevated above the heart. That meant I was lying down a lot. It’s been frustrating, for me this is one of those situations where a person doesn’t know just how much life is impacted with the loss of use of one leg. I can’t do any kind of housework and at first even standing on the one leg while brushing my teeth was hard. Getting up meant the blood rushes down to the injury and the pain comes back with a vengeance. The second week was worse for pain, and only with a triple combo of acetaminophen, icing the leg, and elevation working. The most encouraging thing I found though was this site. Reading about how a lot of people recovered and back to doing normal activities made me think I can do it too. Further, seeing the support that you folks give each other definitely gives me a warm and fuzzy feeling and everything just seems better. Last Monday the cast came off and in a boot, but touch weight bearing only. Went to my first physio appointment yesterday. I’ll update this as I go along with the physio. I hope everyone going through this gets better soon and gets back to normal. In the boot now for two weeks this Monday. Went to PT 3 times. After PT I’ve noticed the swelling went down. The first swelling measurement on Nov 27 said my ankle area swelled by just over 2 inches circumference compared to the good leg. (The good leg circumference at the thinnest point of the ankle is 9 inches) After the 3 PT treatments the swelling is under 2 inches now. The pain has been easing too as the swelling went down, so getting up is not a new definition in throbbing pain every time anymore. Gotta continue the PT for sure! Lots of pain, but not from the ATR. Apparently I’ve been on the wrong height settings for my crutches (which the cast clinic nurse adjusted for me from day 2) and the leg lift exercises caused my back to completely stiffen up. I’ve got major back spasms and my doc told me I also pulled an abdominal muscle. So, back in painkillers for a bit and now I have to lay down quite a bit to let things calm down. PT recommended a different set of leg exercises, less back intensive. A minor setback, but I’m sure I’ll get back on track. I really looked into getting the scooter but my place is 3 storeys and the scooter just ain’t good for all those stairs. Before putting back in boot. Hey everybody, got a rather icky question for all. How does one keep the air cast boot from smelling like hockey equipment? @beanie, thanks for the info and suggestions. After taking a few days’ worth of muscle relaxants those strained muscles feel a lot better. I’ve been trying to go through the walking motion with the boot and crutches, just not putting much weight on the boot. I’m at PWB but the doc said touch-weight only. I see your point right away - there are 2 wedges in the boot right now so the right leg is “taller” than the left one by almost 3″ which makes my hips uneven etc. I considered the even-ups at one point and then thought at 3″ I’ll look like I’m on platform shoes so decided against it, fearing I’d probably have an accident in them. I’ll look at Ryan’s blog. PT also showed me some stretching exercises for the back and hips to keep them nice and loose so that should help. Yay! Go AWT! That was a quick transition to FWB! Keep it up, but also remember to be careful … your tendon is very fragile right now. I had a quick look for the boot walking post by ryanb, the link is http://achillesblog.com/ryanb/2012/06/. Evan (ejbvmi) also posted about boot walking at http://achillesblog.com/ejbvmi/2015/07/03/4-weeks-FWB-in-boot/, the YouTube link is https://youtu.be/4kGY4VBHqq8. Beanie, thanks so much for the great boot walking advice. I just discovered I could walk yesterday (FWB..yay!) and will definitely take a look at that video. Andy, sorry to hear about your back! I am in a boot too and might be starting to feel some effects from it. But hang in there, we can do it! Hey Andy, I’m glad to hear the PT is helping with the swelling and pain! There’s tons of upper body workouts you can do even at home. One of my favorites at home was 21-18-15-12-9-6-3 reps of push-ups, chair 1-legged squats on good leg, chair tricep dips & sit-ups. For the push-ups I found it best to rest my boot on my good foot, putting the boot on the ground hurt my knee. Being able to keep exercising kept me sane and happier. Keep going! I can’t wait to hear your next updates. Shadowrad, from what the doc says, the timeline of the cast depends on the location of the rupture, and also if it affected the calf muscles or not. I looked into the scooter and decided against it. They told me i won’t have weight bearing capabilities on the leg till the 6 week mark after rupture and even then it’s only 50%. Another 2-4 weeks and then I get weaned off crutches. Hang in there! Like I said in the blog part, there are many many people on this site who fully recovered from this and I draw my strength and faith from them. But certainly I found that elevating the leg is the biggest key in keeping swelling down. Thanks for the encouragement beanie! Been catching up on your recovery and still awed by the exercises you’re able to do. I’m trying to keep the other muscles from being atrophied so doing upper body stuff, leg lifts with the boot on, etc. We will get back to full recovery or better! I know it! Hi Andy. Sounds like you got the boot sooner than is in the plan for me. I am now in 6 the week with cast. I have gone through many of the trial that you have , I am sure. One of the best investment for me was getting the scooter that you can kneel on and have a hand free to carry stuff. Crutches are a bummer. It is so hard to ask someone all the time to get this or that , drive me to store or work. I do pretty good as well when I keep the lege elevated. I am also going the non surgical route. Sure hope it heals. Got to have faith! I am not doing the early weight bearing. I am told in 2 weeks I get the boot but still not weight bearing. Hmmm. I will ask some more questions at my next apt in 2 weeks. I am also trying to do the quad exercises, hip stretching as well as upper body weights. Hey Andy, good to meet you but also sorry about the circumstances! The outcome from no surgery vs surgery is statistically the same as long as you have early weight bearing and mobility which it sounds like you do. 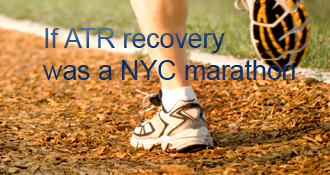 Your recovery won’t be slower than surgery either. So your doc is on point! I’m sure you’ve already seen it, but if not Evan Brown (ejbvmi) has an excellent blog, he’s also non-surgery and early weight bearing, and he’s YouTube’d his rehab exercises at various stages of recovery. Good luck with your recovery, things get better and better each week! andyw’s AchillesBlog is proudly powered by WordPress and WPDesigner..